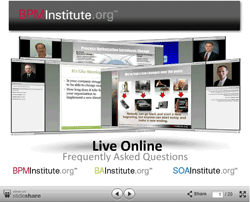 Live Online, On-Demand and Virtual Training are the perfect alternatives to our face-to-face training. Advance your career and your company by taking a single course or earn your BPMPSM Certificate. Take courses from the comfort of your home or office on your PC, phone or tablet. Premium quality training: Same learning interaction as face to face training without the travel expenses. Convenient format: Two half day (4 hour) sessions held live on back to back days. Efficient and cost effective: Login from anywhere with an internet and phone connection. Certificate of Completion: Receive a Certificate of Completion for each course you take. Career advancement: Finish your Certificate of Training over the web. We also offer PDU's. View more eLearning dates in addition to the dates below.